Pseudotumoral uterine lesions include benign reactive and artefactual changes, epithelial and mesenchymal, which occasionally are incorrectly interpreted as malignant or even premalignant lesions. Although some of these changes may have architectural or cytological abnormality, they are different from those observed in premalignant and malignant uterine lesions. The most common pseudotumoral lesions of the endometrium include various types of epithelial and stromal metaplasia, pseudolymphomas, inflammatory pseudotumor, adenomyosis, post-therapy surgical changes, artefactual changes, etc. Most of these changes may coexist with endometrial hyperplasia or endometrial carcinoma, and also with some benign conditions such as polyps or in combination with hormonal therapy or even in normal cyclic endometrium. These associated endometrial changes may raise important issues regarding the diagnosis and subsequent therapy. With the decline of ovarian hormonal function, from the fifth decade of life, women enter the menopause transition, during which bleeding becomes irregular in duration and time of occurrence. Secondary to ovarian dysfunction, developmental and maturation endometrial anomalies occur, which are clinically translated by abnormal uterine bleeding, which in many cases at this age can be caused by organic lesions (fibroma, polyps, endometritis, endometrial hyperplasia, adenomyosis, etc.). The retrospective study included a total of 256 patients with abnormal uterine bleeding in menopause transition. Statistics showed that the incidence of these types of bleeding increases with age (64.5%) and parity (30.5%), with symptoms consisting mostly in different clinical forms of abnormal uterine bleeding (62.1%), and leiomyomas prevailing at histopathological examination (49.6%). Progesterone replacement therapy was the first therapeutic choice for correcting these types of bleeding. Progesterone therapy is useful not only for therapeutic purposes to amend the bleeding, but also as a precaution against the development of endometrial carcinoma. Progestogens cancel the proliferative and mitogenic effect of estrogens, even when administered in sequential regimen 10-12 days per month. Colorectal carcinomas (CRCs) evolve through multiple pathways. These pathways may be defined based on two molecular features: (1) chromosomal instability and (2) chromosomal stability. Tumors showing chromosomal stability evolve through the so-called microsatellite instability pathway. These types of tumors show different clinico-pathological features and need different therapy so very important to separate them. As Hematoxylin-Eosin (HE) based histology is influenced by the different genetic alterations of a tumor, it is reasonable that different gene expression profiles result in different HE morphology. Our aim was to find specific histomorphological features specific for colorectal tumors showing different molecular features. We analyzed the clinicopathological parameters of 324 colorectal carcinomas, 26 hereditary non-polyposis colorectal cancers, 32 sporadic high-level microsatellite-instable (MSI-H) cancers and 266 microsatellite-stable or low-level microsatellite-instable (MSI-L) cancers among them. Our results showed that we could recognize different genetic types of tumors on the base of clinicopathological features like patient's age, tumor localization and histological characteristics of CRCs. Main histological parameters help in differentiation are inflammatory background, nuclear features and pattern of infiltration. Clinical parameters like clinical stage and localization and careful histological analysis helps to select molecular method to define molecular features and to select the most appropriate therapy of a given tumor. Colorectal carcinoma is a major cause of cancer associated with a high rate of morbidity and mortality in the western world. One of the pathologic features considered to be important for prognostic is mucin production. Many authors confirmed that colon carcinomas with high mucin content tend to re-occur locally and carry a poor prognosis. For histochemical evaluation of mucin content, we investigated 149 patients who underwent surgical resection of sporadic colon adenocarcinomas, all over a 5-year period. For histological classification we used the WHO recommendation (2000) and to be more accurate we sub-classified mucinous adenocarcinomas by morphometrical analysis in three categories: pure mucinous, with extracellular mucin more than 80% of the tumoral volume; mixed type, with 50-80% extracellular mucin; and mixed type with less than 50% extracellular mucin. For histochemical investigation, we used stains such as: mucicarmine, PAS/Alcian Blue and High Iron Diamine/Alcian Blue. Our study proved the predominance of mixed mucinous adenocarcinomas with less than 50% extracellular mucin, followed by the pure mucinous type. From the biochemical composition's point of view, the predominant cases were those with acidic mucins, especially in pure mucinous adenocarcinomas (>90%), while those with mixtures of acidic and neutral mucins were present in 62% of the cases. In addition, our study showed the prevalence of sialomucins over sulphomucins (68%), particularly in pure mucinous adenocarcinomas (77%). Clinical pure mucinous forms were detected mainly in advanced stages, but in terms of lymph node metastasis rate, they were secondary after mixed type with 50-80% extracellular mucin. The endocannabinoid system (ECS) is an important physiological system that modulates appetite, food intake, energy homeostasis, substance addiction. It is comprised of the cannabinoid receptors (CB1 and CB2), the endogenous lipid ligands of these receptors and the enzymes that mediate the endogenous ligands' biosynthesis and degradation. CB1 receptor is expressed in the brain, adipose tissue, liver, skeletal muscle, gastrointestinal tract and pancreas. The CB1 receptor is encoded by CNR1 gene located at 6q14-q15 level. The aim of our study was to investigate the possible correlation between rs1049353 polymorphism of the CNR1 gene with levels of adiponectin in a group of subjects from Romania. The study included 305 subjects divided in two groups according to their fasting adiponectin levels. Fasting adiponectin levels were determined using ELISA technique. The genotyping of the rs1049353 polymorphism of the CNR1 gene was made using the Real-Time PCR technique. The statistical analysis was performed using De Finetti's program. The differences between the allelic frequencies indicated that the presence of G-wild allele seems to confer risk for expressing low levels of adiponectin (OR=1.917; 95%C.I.=1.353-2.715; p=0.00023) and A-mutant allele seems to be protective (OR=0.522; 95%C.I.=0.368-0.739; p=0.00023). At the test of allelic positivity, the presence of the G-allele conferred risk of hypoadiponectinemia (OR=2.113; 95%C.I.=1.324-3.373). In conclusion, this study indicates that the rs1049353 polymorphism of the CNR1 gene is associated with decreased levels of adiponectin. Further research is needed in order to elucidate the link between the polymorphisms of the CNR1 gene and adiponectin levels. Our immunohistochemical study wants to be a contribution to clarifying the adenoma-carcinoma sequence and serrated pathway of colorectal carcinogenesis. Thus, we performed immunohistochemical analysis of hyperplastic polyps (HP), serrated adenomas (SA), and classical adenomas (tubular adenomas - TA and tubulovillous adenomas - TVA) and carcinomas developed from adenomas (CA) using expression of p53, Ki-67, c-myc, APC, MSH2 and Ets-1 proteins. Because of correlation of the expression of these proteins, we propose several immunophenotypes, which show modifications along the known carcinogenetic mechanisms. Along the adenoma-carcinoma sequence we noted an increase in the expression of p53, Ki-67, c-myc and Ets-1, and a decrease in APC expression. The majority of TAs and TVAs are characterized by p53+/Ki-67+, p53+/c-myc+, p53+/APC+, and Ets-/p53+, Ets-/Ki-67+ immunophenotypes. The majority of HPs and SAs are Ets-/p53-, Ets-/Ki-67+, Ets-/c-myc+, APC+/MSH2-. In approximately 1/3 of the hyperplastic polyps and serrated adenomas, we noted that the decrease in expression of MSH2 is associated with an increase in the expression of p53, c-myc, Ki-67, and Ets-1. Thus, we can conclude that a group of hyperplastic polyps and serrated adenomas display similar immunohistochemical characteristics to tubular and tubulovillous adenomas, which delineates a group of precancerous lesions that can develop via mixed carcinogenic pathways. The aim of the study was the isolation and characterization of mesenchymal stem cells from the placental chorion from a genotypical and phenotypical point of view. The placentas included in the study were derived from term pregnancies with a normal evolution. Along with the placentas, umbilical cord blood, maternal and newborn peripheral blood samples were taken. The isolation and culture of chorionic and, incidentally, trophoblastic cells was followed by the determination of markers of the former cells. They expressed proteins and genes characteristic of stem cells. Immunofluorescence and evaluation of gene expression evidenced the pluripotential properties of these cells and also their higher position on the differentiation pathway. HLA expression provides information that might help explain the immunological mechanisms of tolerance between the maternal organism and fetal structures. 9. Neuroimaging parameters in early open spina bifida detection. Further benefit in first trimester screening? Objective: Morphological investigation of the central nervous system (CNS) in fetuses with positive markers for open spina bifida (OSB) detection, visualized by ultrasound during the first trimester of pregnancy. Materials and Methods: Data from fetuses that underwent routine first trimester ultrasound scan in our center during September 2007-March 2011 and presented abnormal aspects of the fourth ventricle, also referred as intracranial translucency (IT), provided the morphological support to evaluate CNS features. A neuro-histological study of posterior cerebral fossa illustrated anatomical features of the structures involved in the sonographic first trimester detection of neural tube defects. Results: Abnormal IT aspects were found in OSB cases examined in the first trimester, but also in other severe cerebral abnormalities. Brain stem antero-posterior diameter (BS) and brain stem to occipital bone (BSOB) ratio may be more specific for OSB detection. Correlations between histological aspects of posterior brain fossa and ultrasound standard assessment have been made; highlighting the anatomical features involved by the new techniques developed for OSB early detection. Conclusions: Preliminary results show that modern sonographic protocols are capable to detect abnormalities in the morphometry of the posterior brain. First trimester fourth ventricle abnormalities should be followed by careful CNS evaluation because are likely to appear in OSB affected fetuses, but also in other CNS severe anomalies; in such cases, normal BS and BSOB ratio may serve as indirect argument for spine integrity, if specificity is confirmed in large series of fetuses. Lengthening the mandible by distraction osteogenesis (DO) is nowadays a well-recognized technique in maxillofacial surgery. This study compared two different distraction rates and evaluated histological and histomorphometrical properties of the distracted bone in an experimental ovine mandible model with the goal of elaborating a universally accepted distraction protocol. Study Design: Tissue blocks of regenerated bone were harvested from twelve young adult sheep. DO was performed on the mandibular midline after five days of latency period. The sheep were divided into two groups. The first group underwent activation of 0.8 mm/day during 12 days resulting in 9.6 mm of new bone while the second group followed a geometric rate pattern of 0.2 mm - three days, 0.4 mm - three days, 0.8 mm - three days and 1.6 mm - three days resulting in 9 mm of new bone. The regenerated bone was histologically and histomorphometrically analyzed after 30, 45 and 60 days of consolidation. The relative osteoid volume (OV/TTV) was significantly increased in the geometric rate distraction group (p=0.015) comparing with linear distraction group while the relative bone volume (BV/TTV) was significantly increased in the linear distraction group (p=0.019) compared to the geometric distraction group. Purpose: To investigate by means of CBCT the presence of lingual foramina and their bony canals in the midline of the mandible and to describe their anatomical characteristics. Materials and Methods: CBCT examinations of 36 patients were carefully examined in the median region of the mandible in order to detect the lingual foramina and their corresponding vascular canals. Their presence, number, position, diameter and trajectory were established. Results: Lingual foramina in the midline of the mandible were observed in all 36 subjects. The number of canals varied from one to four, with the following distribution: one canal in 71.9% of the cases, two canals in 9.4%, three in 15.6%, and four canals in 3.1% of the cases. The average diameter of the canals was 0.84 mm. The average distance from the foramina to the base of the mandible was of 11.2 mm. 19.4% of the vascular canals penetrated only the lingual third of the width, 52.8% reached the middle third of the mandible and 27.8% of the canals spread to the buccal third. Conclusions: CBCT is a useful tool in planning an implant treatment. It can reveal multiple anatomic features of the mandible, including the presence and the morphology of the lingual foramina and their vascular canals in the median region of the mandible. Clinicians should acknowledge the presence of these anatomical structures and should be aware of their possible implications. Besides lesions considered to be premalignant (such as erythroplasia, Bowen disease), a number of other potentially malignant lesions with higher or lower degree of epithelial dysplasia depending on the keratinization degree or determined by the action of carcinogens and irritants substances are described in the oral mucosa. Although they are practically considered the most harmless formations located on the oral mucosa, papillomas and condylomas are also the most frequent. In this study (conducted on a total of 38 cases with benign neoplasia) we planned a histopathological evaluation of surgical excision samples obtained from interventions on lingual neoplasias and harvested from the areas most exposed to chronic trauma or the areas in direct contact with mechanical irritants, in order to determine the histopathological pattern of the different types of histopathological lesions, the possible presence of keratosis-type changes or even possible dysplasias. Pterygium represents an epithelial hyperplasia associated with fibro-vascular growth. It is an active process, associate with cellular proliferation, remodeling of the connective tissue, angiogenesis and inflammation. The aim of this study consists of emphasizing angiogenesis involvement in the pterygium pathogeny. 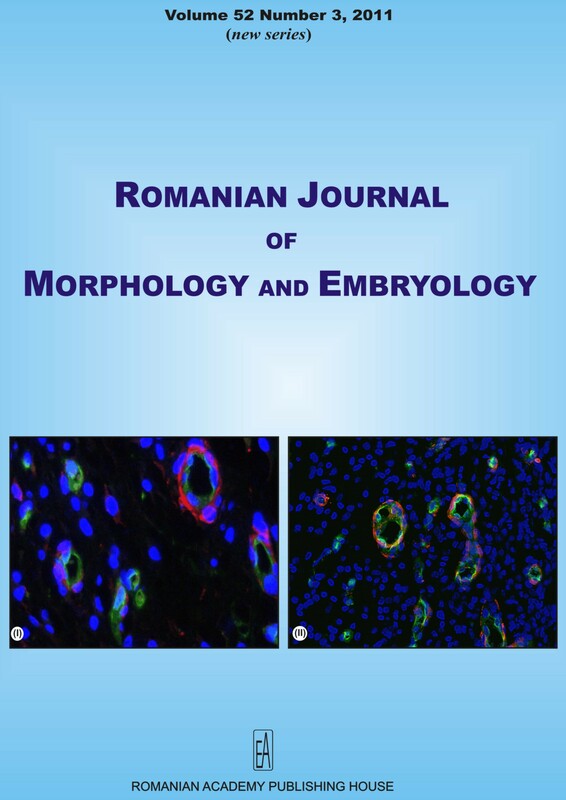 The material used for this study consisted of 21 pterygion fragments surgically removed in the Ophthalmology Clinic of the Emergency County Hospital, Craiova. Nine patients were men, 22 were women, and they were aged between 58 and 81 years. Ten fragments of epibulbar conjunctiva from the vicinity of the sclero-corneal limbus were used as control tissue. They were initially histological processed by paraffin inclusion. The immunohistochemical processing was made in the Histological, Histopathological and Immunohistochemical Techniques Laboratory of the University of Medicine and Pharmacy of Craiova. The working technique used was ABC/HRP (Avidin complexed with biotinylated peroxidase). Angiogenesis in the pterygion was investigated with CD31 marker that allows the identification of the vascular endothelium and the establishment of the vascular microdensity and with VEGF, which allowed the identification of the main source of proangiogenic factors in pterygium. Our study emphasized the existence of a much richer vascularization at the level of the pterygium, compared with the one of the normal conjunctiva. The respective blood vessels were best represented in the subepithelial conjunctive, due to the increased necessities of the proliferating pterygium epithelium. The morphology of the blood vessels is specific for the neoformation vessels, which have a small caliber, are branched and have a rarely visible lumen. The investigation of the vascular microdensity has shown the existence of an intense angiogenesis process at the level of the pterygium and the overexpression of the VEGF, mainly in the proliferating structures of the pterygium, plead for the pathogenic involvement of this growth factor in the development of the pterygium. Hepatocellular carcinoma (HCC) currently represents the fifth most common cancer worldwide, while being the third leading cause of cancer death. Fractal analysis is a novel tool used in quantitative and qualitative image assessment. Vascular patterns and cellular nuclei particularities in tumoral pathology make ideal candidates for this technique. Our aim was to apply fractal analysis in quantifying nuclear chromatin patterns and vascular axels in order to identify differences between images of primary HCC, liver metastasis (LM) and surrounding normal liver tissue. Formalin-fixed, paraffin-embedded tissue sections from 40 cases of HCC and 40 LM of various origins were used. We performed Hematoxylin staining for nuclear chromatin as well as immunohistochemical staining for vascular patterns. High-resolution images were captured; nuclear and vascular morphologies were assessed on binarized skeleton masks using the fractal box counting method. Analysis was performed using the free, public domain Java-based image processing tool, ImageJ, which provided the fractal dimensions (FDs) for each studied element. Statistical analysis was performed using the ANOVA test with Bonferroni post-tests and t-tests for paired samples. Fractal analysis of vascular patterns clearly differentiated between tumoral tissue and normal surrounding tissue (p<0.01). Further analysis of nuclear FDs improved the specificity of these results, providing clear differentiation between pathological and normal tissue (p<0.01). When comparing primary HCC images with metastatic formations, we encountered statistically significant differences in nuclear chromatin assessment. However, blood vessels had a higher FD in primary tumors when compared with liver metastasis (p<0.05) and also allowed for a differentiation between primary liver tumors with and without neurodifferentiation. Fractal analysis represents a potent tool for discriminating between tumoral and non-tumoral tissue images. It provides accurate, quantifiable data, which can be easily correlated with the pathology at hand. Primary and metastatic liver tissue can be differentiated to some extent, however further studies, possibly including other variables (cellular matrix for instance) are needed in order to validate the method. Introduction and Objectives: Conservative renal surgery is based on the nephron-sparing principle. Renal arterial vascularization is of terminal type and the occlusion of an artery generates the necrosis of the corresponding region. The aim of this research is to analyze the anatomic particularities of the renal vascular system as they are highlighted in the course of standard and robotic surgeries. Patients and Methods: Between May 2006 and November 2010 we have performed 35 partial nephrectomies out of which 30 cases (85.7%) were performed by standard surgical approach and the other five (14%) were robot-assisted. In the same interval, we have done 103 pyeloplasties to obstruct the pyeloureteral junction: 65 (63%) were carried through by standard surgical approach, 32 (31%) by laparoscopic approach and six cases (6%) were robot-assisted. Results and Discussion: In 20 (54.3%) of cases, nine (25.7%) had two renal arteries (both superior and inferior), five (14.2%) had early ramifications of the renal artery outside the renal sinus, four (11.4%) patients showed two renal veins, one patient lacked the prepyelic venous plane, and in one patient we have found duplicate abdominal vena cava. Out of all the pyeloplasty cases, 31 (30%) showed an obstruction of the renal collecting system by crossing with a segmental artery or with a vein. Conclusions: Efficient renal surgery implies good knowledge of anatomical particularities of the renal vascular. The minimally invasive approach by robotic laparoscopy remains an essential coordinate in renal surgery and allows an efficient preparing of the vascular capital. Objectives: To study the morphology and topography of nutrient foramina and to determine the foraminal index of the upper limb long bones. Materials and Methods: The study comprised 243 upper limb long bones, which included humeri, radii, and ulnae. The nutrient foramina were identified macroscopically in all the bones and an elastic rubber band was applied around these foramina. The bones were photographed with the digital camera and foramen index was calculated. Each bone was divided into five equal parts and was analyzed topographically. Results: From our observations, 93.8% of the humeri had single nutrient foramen. The double foramen was observed in 3.1% of the cases and the foramen was found absent in 3.1% of the humeri. In case of radius, 94.4% had single foramen, 1.4% had double foramen, and in 4.2% of the cases, it was absent. With respect to ulna, all the 75 bones had single foramen. The mean foraminal index was 57.6 for the humerus, 34.4 for both the ulna and radius. The majority (70%) of the foramina in humerus were located at the 3/5th part, 83.6% of the ulnae foramina at the 2/5th part and 87.7% of the radii foramina at the 2/5th part. Conclusions: The study has provided additional information on the morphology and topography of nutrient foramina in upper limb long bones. The knowledge about these foramina is useful in certain surgical procedures to preserve the circulation. As microvascular bone transfer is becoming more popular, a convention for the anatomical description of these foramina is important. A two years prospective study was developed, based on the monitoring of 84 patients with cirrhosis and elevated serum creatinine; 33 patients met the diagnostic criteria for the hepatorenal syndrome. In these 33 patients, survival rate has been studied in correlation with hepatorenal syndrome types, serum albumin and natremia. Considered as an extension of both laparoscopic surgery and interventional endoscopy, natural orifice transluminal endoscopic surgery (NOTES) is emerging as a new alternative of minimal invasive surgery. Literature on the gastrointestinal complications of this novel technique is sparse. The goal of this study was the histopathologic evaluation of postoperative complications in a NOTES experimental animal group. Ten female pigs (Sus scrofus domesticus) underwent transgastric endoscopic oophorectomy and tubectomy followed by gastric closure using OTSC clips. Fourteen days after surgery, the animals were sacrificed. Based on the gross examination during necropsy focused excisional biopsies were performed. Gross and microscopic evidence of gastric ulcer distal to the puncture site and perigastric lymph node abscess were found on one animal. Histological evaluation plays a determinant role in the correct evaluation of postoperative complications of pure NOTES procedures. Objective: Aim of this study was to determine the distance between Henle's spine (HS) on the temporal bone to the clinically important bony landmarks on the dry skulls that will act as a guide in various surgical procedures on skull base. Distances from the head of malleus (HOM) to surgically relevant landmarks were also studied on CT images. Materials and Methods: Thirty-nine adult preserved dry skulls were studied bilaterally. The parapetrosal triangle bounded by spinopterygoidal, bispinal and the midsagittal lines was identified. The location of the HS and its distance from the various important anatomical structures were measured. In addition, five CT images, where distances from the HOM to various anatomical landmarks were measured. Results: The mean and range of distances from the HS to various important anatomical landmarks on the spinopterygoidal line, bispinal line and in the parapetrosal triangle were tabulated. The mean and range of CT-based measurements of distances from HOM to other anatomical landmarks were also noted. Conclusions: The knowledge of unvarying relationship of the HS and the HOM to the various structures of the skull would assume significance while planning surgeries around the temporal bone by guiding the direction and degree of bone removal. Statistical differences between the two genders showed significant difference only in the distance between the HS to the medial margin of the external orifice of carotid canal. Therefore, these landmarks can also be applied as references for various surgeries of middle cranial fossa, as well as transpetrosal and transmastoid approaches. Objective: Bacopa monniera (BM), a traditional Ayurvedic medicine has been used in treatment for a number of disorders, particularly those involving anxiety, intellect and poor memory. The current study examined the effects of standardized extract of Bacopa monniera on the dendritic morphology in adult rats of hippocampal CA3 neurons, one of the regions concerned with learning and memory. Materials and Methods: Adult Wistar (2.5-month-old) rats were designated into 2-, 4- and 6-week treatment groups. Rats in each of these groups were divided into 20 mg/kg, 40 mg/kg and 80 mg/kg dose groups (n=8 for each dose). These rats along with age-matched control rats were then subjected to spatial learning (T-maze) and passive avoidance tests. Subsequent to the T-maze and passive avoidance tests, these rats were killed by decapitation, brains were removed and hippocampal neurons were impregnated with silver nitrate (Golgi staining). Hippocampal CA3 neurons were traced using camera lucida. Dendritic branching points (a measure of dendritic arborization) and dendritic intersections (a measure of dendritic length) were quantified. These data were compared with control rats. Results and Conclusions: The results showed improvement in spatial learning performance and enhanced memory retention in rats treated with BM extract. There was a significant increase in the dendritic intersections and dendritic branching points along the length of both apical and basal dendrites in rats treated with BM extract for four and six weeks. However, the rats treated with BM extract for two weeks did not show any significant change in hippocampal CA3 neuronal dendritic arborization. We conclude that constituents present in BM extract have neuronal dendritic growth stimulating properties. In the past 30 years, after the discovery of vascular proliferation factors, angiogenesis is one of the most intensively studied fields. Restoring the vascular network after burn injury is essential for healing, as it brings oxygen and nutrients to injured tissues, improves the contribution of inflammatory cells and prepares the damaged area for repair and tissue regeneration. To study the process of angiogenesis we used seven groups of five animals, each of adult Wistar rats, which were inflicted with third degree skin burns. From each group of animals, we sampled at successive intervals of three days the entire burnt wound with a ring of surrounding normal skin. Sampled skin fragments were processed for paraffin inclusion, sectioned with a microtome and stained with Hematoxylin-Eosin or Masson trichrome. The samples were also analyzed using single chromogenic immunohistochemistry or double immunofluorescence for the presence of CD34 and alpha smooth muscle actin (alpha-SMA). Angiogenesis process started at about three days after the burn infliction, with the appearance of tubular structures lined by CD34-positive cells. Subsequently, these cells showed intense proliferative activity that generated a network that included progressive neovascularization around the wound surface. Maximum vascular proliferation occurred at 9-15 days after injury, when the number of capillaries reached 229/mm(2), and the total area of capillary angiogenesis at 100.27 micro-m(2) (about 10% of the section area). Subsequently, the process of angiogenesis was gradually reduced, but remained at moderate levels after wound healing. During the process of angiogenesis, there was a very close relationship between CD34-positive cells and pericytes (as alpha-SMA-positive). Background: We report here a case of a 66-year-old woman with a very aggressive form of breast carcinoma, having both liver and bone dissemination points. Case Description: The patient was admitted for a rapid onset disk-herniation-like syndrome, but which on further investigation proved to be in fact a metastatic case of breast cancer. We found evidence of disseminations at least in the lumbar vertebral bodies and the liver. Pathological analysis of the available vertebral metastasis revealed a HER2+ molecular pattern, accordingly to the newly evolving molecular typing of breast cancers. Despite a rapid treatment instauration, the patient reacted poorly to taxanes and octeoclast inhibitors, and died after less than 11 months from admitting to the hospital. Conclusions: This is a rare case of an aggressive breast carcinoma identified initially after the vertebral metastases themselves that induced a non-specific symptomatology. Chronic myelogenous leukemia (CML) accounts for 15-20% of adult leukemias but is very rare in children (2%). Fewer than 10% of CML patients are younger than 20 years. CML is a myeloproliferative disorder characterized by the presence of the Philadelphia chromosome or the BCR-ABL fusion oncogene. The objective of this paper is to present the monitoring of imatinib therapy in two children with CML by the BCR-ABL fusion gene expression assessment from peripheral blood with quantitative real-time polymerase chain reaction (PCR) method. Patients and Methods: The 18 and six months follow-up of the patients included clinical examination, routine laboratory tests, bone marrow aspirate investigation including cytogenetic tests and the major BCR-ABL fusion gene expression measurement with qRT-PCR method from the peripheral blood. Results: Patient No. 1 diagnosed with chronic phase CML showed excellent adherence to daily 400 mg imatinib treatment and achieved complete hematologic (CHR) and cytogenetic response (CCR) by three months and major molecular response (MMR) by 12 months, with lack of side effects due to imatinib. Patient No. 2 experienced severe hematologic toxicity, which necessitated temporary withdrawal of the drug. Transient non-compliance together with imatinib dose reduction has driven to treatment failure. In this case, mutational analysis is warranted. Conclusions: BCR-ABL fusion gene expression level measurement from peripheral blood with qRT-PCR method is an excellent tool in the follow-up of CML patients. Sinusoidal hemangioma is a rare variant of cavernous hemangioma that develops more frequently subcutaneous, often in the extremities. We report the case of a 19-year-old patient three times operated for a recurrent soft tissue tumor, located in the distal third of the antero-medial face of the right arm. Treatment was surgical and consisted of microsurgical excision of a tumor with dermal and intramuscular location. Histopathological analysis showed a nodular proliferation of interconnected thin-walled blood vessels, sinusoidal growth pattern and the presence of pseudopapillary structures. Immunohistochemical investigations were positive for CD31, CD34 and Ki67 index decreased, confirming the benign nature of vascular proliferation. We identified the mutations in two patients with different phenotypes of dystrophic epidermolysis bullosa (DEB). We performed molecular diagnosis to a patient aged 45 years who showed the typical severe generalized autosomal recessive DEB signs when admitted to the hospital. The other patient is a 4-month-old boy who showed a moderate clinical aspect of DEB, dominated by nail dystrophy. The molecular diagnosis disclosed in the first patient the presence of a heterozygous mutation consisting of a nucleotide substitution that lead to a splice site mutation, namely 425-2 A>G, associated to a premature termination codon, in exon 5, namely c.553 C>T, p.R185X and in the second patient a heterozygous substitution at nucleotide position 6100 that converts a glycine amino acid to arginine (6100G>A). The mutation is designated G2034R. We conclude that molecular diagnosis is the conclusive EBD investigation, maps the phenotype of a patient with his genotype and thus allows a better understanding of the disease mechanism and the development of gene therapy. Molecular diagnosis also enables genetic counseling and prenatal diagnosis. Lower canine is a tooth with a robust, long root and very good implantation, making it a valuable abutment tooth for any type of prosthetic treatment. In order to treat it conservatively and to prevent its loss from the dental arch it is necessary to accomplish a correct and complete endodontic treatment, which involves knowledge of all its morphological variation. The mandibular canine usually presents one root with a single large canal centrally located. The possible anatomical variations are the existence of a single root with two canals and of two different roots, each having a canal. The incidence of lower canines with two roots is usually low, as described in various studies, but their presence in everyday practice shows that the clinician must consider them if he wants to prevent dental endodontic treatment failure. This article presents a relatively rare case of a patient whose right mandibular canine has two roots and two canals. Although the frequency of mandibular canines with two roots is very low, we must not forget that we can deal with such cases, which can obviously occur even in patients in our country, as the ones described in foreign specialty literature. Idiopathic orbital inflammatory pseudotumor is a chronic neoplasm-like inflammatory reaction, usually affecting the orbital tissues of both eyes and orbit. Isolated optic nerve involvement by the idiopathic inflammatory process is a rare finding and very few reports are available. Here a case of an isolated orbital nerve inflammatory pseudotumor presenting with gradually progressive unilateral loss of vision is described. It showed dramatic response to surgery and steroid treatment and its differential diagnoses are discussed. The sphenoid sinus is one of the most morphologically variable and surgically important structures of the skull base. Located below the sella turcica, neighbored by parasellar regions, such as the orbital apex, pterygopalatine fossa and lateral sellar region (cavernous sinus), it is clinically related to these and surgically relevant as corridor for various approaches. Moreover, at the sphenoethmoidal junction, important variations occur, most of these related to the presence of the Onodi cells and the intrasinusal protrusions of the optic nerve. That is why any identified and previously undescribed morphological variation at that level must be added to the well-established protocols, clinical and surgical. During a retrospective CT study of the sphenoid sinus anatomical features a previously unreported morphology was encountered and is reported here. It refers to a unilateral sphenoethmoid cell (SEC), Onodi-positive, not only overriding the superior aspect of the sphenoid but also its lateral side to get intimately related to the maxillary nerve. As that SEC expanded medially to the cavernous sinus apex, it altered the usual endosinusal morphological correlations and also added itself within the limits of the Mullan's triangle. It appears so that such postero-infero-lateral extended pneumatization of an Onodi cell alters the surgical landmarks and also can blur clinical pictures, by adding maxillary and pterygopalatine signs and symptoms. Like any other medical intervention, the orthodontic treatment may have, besides the positive effects, also unwanted secondary consequences. The aim of this study was to evaluate the changes present in dental hard tissue associated with orthodontic treatment. The stereo-microscopic ex vivo analysis was performed on two sets of maxillary first premolars undergoing orthodontic treatment for a long period of time (12 and 23 months); five teeth with other clinical situations were used as controls. By analyzing the teeth undergoing orthodontics, enamel color alterations were mainly found adjacent to the bracket, more pronounced in the gingival area, suggesting the need for a correct oral hygiene around it. Roughness was higher on the enamel surface corresponding to the bracket's base, aspect linked to the resign impregnation during bonding procedures. At the apical part, changes regarding contour, appearance and surface roughness were noticed. These modifications were suggestive for the presence of apical root resorption. The severity of root resorption was not correlated with the duration of treatment. In conclusion, through microscopic analysis changes that may be associated with orthodontic treatment have been observed in both crown and apical level. Kaposi sarcoma is a low-grade neoplasm first described by Moricz Kaposi in 1872. Although many attempts have been made to explain its pathogenesis, its etiology still remains obscure. In this regard, many aspects of the disease's genetic, epidemiological and histopathological backgrounds are even today unclear. We present the case of a 57-year-old male patient, constant HIV negative, with a history of plaque-like lesions on his right foot approximately two years ago. Following surgical removal, a diagnosis of Kaposi sarcoma, plaque stage was settled. One year after, the patient was admitted to the hospital for pain in the right ankle and foot, associated to paresthesis and trophic lesions at this level. Similar lesions developed in the popliteal fossa. Biopsy and subsequent histological and immunohistochemical examination revealed a KS at that level. The most recent hospital admission revealed the appearance of an indolent lymphadenopathy in the groin. Our case represents a rare occurrence of Kaposi sarcoma at a HIV-negative patient, which, after several local recurrences and progressive behavior, produced a lymph node involvement at the groin level. The immunohistochemical assessments have confirmed the diagnosis. 31. The lateral incisive canals of the adult hard palate - aberrant anatomy of a minor form of clefting? Except the oral clefts and their associated dental development disturbances, no other discrete morphologies are reported in the literature as related to altered fusions of the fetal maxilla and premaxilla. We report here two cases related by the persistence in adult of an aberrant canal at the fusion site of the fetal premaxilla and maxilla. The first case presents an anastomosis of the superior anterior alveolar and greater palatine nerves, encountered during the dissection of a human adult male cadaver; that anastomosis, bilaterally present, projected on the aforementioned fusion site and traversed the hard palate to continue within the maxillary sinus wall. The second case evidenced on CT the unilateral presence of aberrant lateral incisive canals (LIC) at the level of the fetal premaxilla and maxilla fusion site; those canals, external (1.5 mm diameter) and internal (1.07 mm diameter), were corresponding as location to that one traversed by the aberrant anastomosis in the first case. Both LIC opened inferiorly but not superiorly, rather seeming to communicate with the bony canals within the nasal fossa floor at that level. We consider that such aberrant canals and nerves may represent very rare forms of clefting, previously undescribed; the possible anastomoses of the superior anterior alveolar and greater palatine nerves can be altered during a Le Fort I fracture and may be the morphology that can explain aberrant clinical nervous distributions at the level of the upper dentoalveolar arch and hard palate.